Enjoy real-world clinical experiences that will complement and enhance your classroom education. Thank you for your dedication to improving the lives of pets and their people. Banfield wants to support your education by providing programs, hosting events and offering growth opportunities that help you take your career wherever you want it to go. The Student Job Program is designed for veterinary students who want to experience real-world learning in a clinical setting. For 80 percent of the time, you’ll work with an experienced veterinary team in one of Banfield’s hospitals to gain confidence in your technical abilities and develop interpersonal communication skills. The remaining 20 percent of your time is dedicated to pursuing personalized learning objectives alongside your coach doctor who will help you determine learning objectives based on your individual educational goals. Under the supervision of your coach doctor and in accordance with the state's practice act, you will work as a veterinary assistant in a supportive team environment. You’ll learn how to perform a physical exam, provide proper veterinary care, use diagnostic tools and interpret diagnostic materials effectively, learn surgical preparation and monitoring, and grow your professional interpersonal skills through communication training. To participate in the Student Job Program, you must be a first- through third-year veterinary student enrolled in an accredited doctor of veterinary medicine program; authorized to work in the United States; available for a 6- to 10-week period during your summer break and committed to a flexible schedule of 32 to 40 hours per week, including evenings and weekends. Preference is given to students studying Companion Animal Medicine. If you have any questions, please contact the Banfield Student Programs team at StudentPrograms@banfield.com. Making the transition from veterinary student to working in a professional practice is a big step. Through Banfield's DVM Externship Program, we’re here to support you as you move forward in your career. As a student in your clinical rotations, you’ll get the opportunity to work alongside a team of Banfield professionals and participate in all aspects of patient care. You will be assigned a mentor doctor and work on pre-determined learning objectives. You'll also get an invaluable, realistic look at life as a veterinary professional with client interaction and firsthand experience in a hospital setting. Participants in the Externship Program experience the typical caseload of a small animal practice. Under the supervision of your mentor doctor and in accordance with the state’s practice act, you will gather histories, perform complete physical exams, develop diagnostic and therapeutic plans, scrub in to surgery, assist in the management of medical cases, provide wellness care, develop client communication skills, polish your clinical/technical skills and learn Banfield's approach to business. Banfield offers a competitive hourly wage to participants (except where prohibited by school regulation). Program placement requires participation in an application, selection and onboarding process. Your primary mentor doctor will conduct your evaluation at the conclusion of the program. For questions about scheduling an externship or to view our learning guide, submit an inquiry via email to the Banfield Student Programs team at studentprograms@Banfield.com. In the request, include your top three locations of interest and proposed dates. 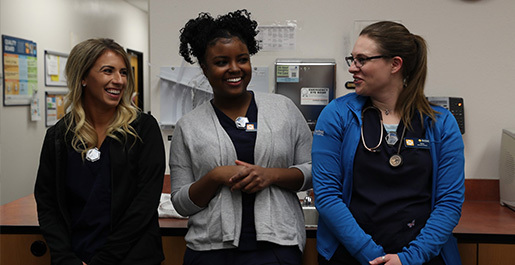 Banfield’s Student Ambassador Program employs veterinary students enrolled in American Veterinary Medical Association-accredited colleges of veterinary medicine to connect their fellow classmates with experiential learning opportunities in Banfield hospitals and act as liaisons between Banfield and their campus. Veterinary Technicians are an integral part of any hospital team. Banfield’s Veterinary Technician Externship is available to help you reach the next step in your education and future career. As a participant, you will not only get to work with the entire veterinary team, but also have a licensed coach (DVM or credentialed Veterinary Technician) to support you in achieving your learning goals. The Veterinary Technician Externship is designed to provide an ideal learning environment for students during their practicum/clinical period. In accordance with the state practice act, you and your coach will work together to achieve the pre-determined learning objectives set forth by your school. You will also experience firsthand how a successful veterinary hospital is operated, as well as best prepare for your state exam (if required) and the Veterinary Technician National Exam (VTNE). Our Veterinary Technician Externship is flexible—while placements typically range from four to eight weeks, we can accommodate up to twelve weeks. Your schedule will include days, evenings and weekends. In order to qualify, you must be currently enrolled in an AVMA/CVTEA accredited Veterinary Technology program and be authorized to work in the United States. Banfield offers a competitive hourly wage to participants (except where prohibited by school regulation). Program placement requires participation in an application, selection and onboarding process. For questions about scheduling a placement, submit an inquiry via the form below, or e-mail the Banfield Student Programs team at studentprograms@banfield.com. In the e-mail request, include your top three locations of interest and available timeframes. We will begin inviting those eligible for participation to apply beginning on the launch date. We’d love to connect with you during one of the following academic or industry events. 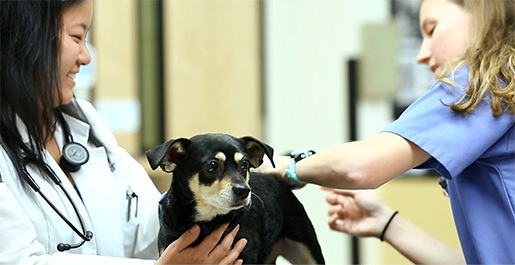 Student events are hosted by Banfield at veterinary schools in the spring and fall. To find out when we'll be visiting your campus, talk to your Banfield Student Ambassador. Banfield attends local and national veterinary conferences presented by the North American Veterinary Community (NAVC), Western Veterinary Conference (WVC), the Student American Veterinary Medical Association (SAVMA), American Veterinary Medical Association (AVMA) and the National Association of Veterinary Technicians in America (NAVTA). Please visit these individual sites for information on events in your area. More than 100 key leaders in our industry come together to discuss issues facing our profession in the annual Industry Summit hosted by Banfield. Attendees include leaders in government, academia, private practice and members of national veterinary organizations.